Are you looking for a glamorous touch to the upcoming season? The perfect way to stay glamorous and attract all the attention to yourself is to wear beautiful jewelry and what is better than a lovely pair of earrings that will surely help you stand out in a crowd? 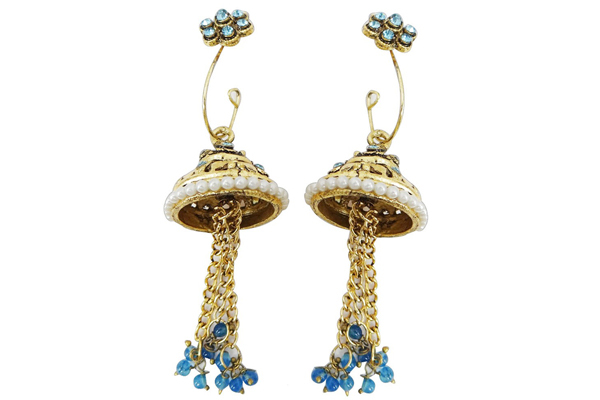 These following beautiful earrings pairs are made to help you shine. 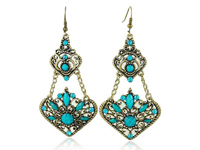 Ethnic is the new trend and it seems that ethnic colored earrings are becoming more and more popular on the catwalk. This means that you can choose anything ethnic and colored to be glamorous this season and the biggest benefit is that ethnic earrings can be quite inexpensive. The new Alexander McQueen collection features colorful beads and stones in intricate ethnic patterns. Nature seems to be another inspiration for jewelry this season as the Michael Kors collection seems to be taken from forests and flowers with colorful and vibrant colors, for both the watches collection and the jewelry collection. Big metal jewelry is also a big trend as seen on necklaces but also on big earrings that are featured in most spring collections and it is known that you cannot fail to stand out with big metal earrings. A whole range of textured fabrics will be used to jewelry such as wood, leather or even plastic so it’s time to rethink what jewelry and glamorous means because it will be achieve with unconventional materials. Another main trend is long earrings; besides being lovely to look at they are also quite feminine and give the wearer a beautiful sweet look with an elegant touch. Long earrings that feature bulky gemstones that sparkle in the light are the next season’s favorite accessories. Another type of long earrings we will definitely see are flowery earrings and antique looking long earrings that seem like your grandmother’s accessories remade with a futuristic look. Vivid colors are definitely a trend and they will surely give your outfit a fresh look. With beautiful and colorful earrings you can be sure to sparkle in this spring and summer. Geometric shapes with vivid colors are definitely a new trend and will be in for a very long time because it seems that minimalistic and futuristic approach is another way designers choose to express themselves this summer. Also, insects and animal figurines are becoming more and more popular and many designers use them for brooches and earrings, especially for the spring collections.